The dramatic loss of forests in Southern Chile and Argentina challenges classical environmental policies. Their recovery requires environmental planning in the time scale of centuries and even beyond one thousand years. But the time scales considered under present-day development hardly deal with a few years of recovery. Consequently, an effective conservation requires placing objectives in the third millennia and thus, implies that we must start thinking and feeling like araucarias trees. Fires of large tracts of forests in southern Chile and Argentina in March 2015 have caused a justified alarm. 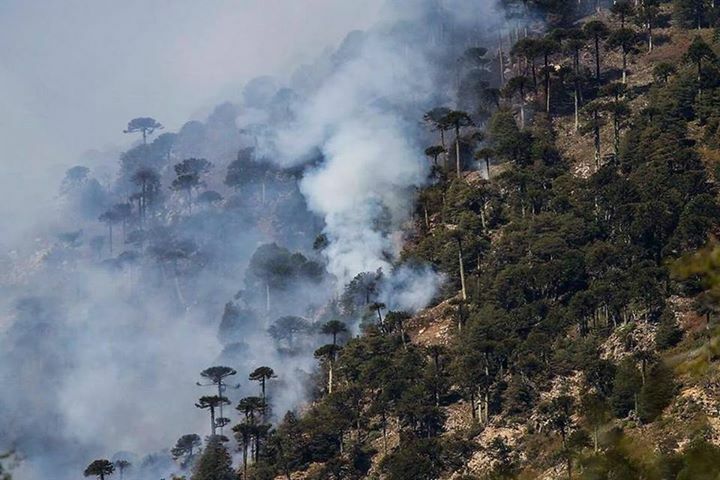 Namely, in Chile more than 6.000 hectares in the Reserva Natural China Muerta and Parque Nacional Conguillío were burnt, and in Argentina more than 1600 hectares in the Natural Park Los Alerces came into flames. Affected ecosystems were those of the southern temperate-to-cold forests in the Andean slopes. Noteworthily, the species present in that region are the coniferous Araucaria (Chilean pines, or Pehuén for Native indigenous Mapuche; Araucaria araucana) and the cypress Alerce (Patagonian cypress, or Lahuán for Mapuche; Fitzroya cupressoides). Most debates around the fires in those remote locations in the southern tip of South America, deal with the weakness of the State at fighting the flames or at developing good prevention programs. For instance, in some of the aforementioned cases, the fire devoured the forest because of the incapacity to stop it. Under this painful loss of the southern natural heritage, the issue of contrasting human and forest timescales is not at all easy to deal with. This is, however, a critical issue because the Araucarias and Alerces that were burnt in those fires may be centuries old; some even more that 1.000 years old. Sergio Donoso, a Chilean forestry academic, points out that many of these trees were there before the creation of the Chilean State and even precede the arrival of the Spanish colonisers. As he comments, we face a “dimension of time beyond our comprehension. The forests that are disappearing have stories in scales much more extended than we can deal with”. The areas now in ashes used to be the habitat of other remarkable trees, such as the southern oaks Lengas (Nothofagus pumilio) and Coigües (Nothofagus dombeyi) that may be around 400 years old. Araucarias, in turn, can reach a thousand years old, while Alerces even 3000 years old. The loss of these forests requires environmental restoration tasks along centuries and even millenniums. Actions and programs, both at the level of the government and in society, should point to year 3015. This may sound senseless to many, as today the rhythms of our lives pay attention to hours, minutes and even seconds. Personal and family activities are planned on scales of weeks to months. Governments rarely plan, and when they do, those plans hardly go beyond the next 4 or 5 years. There is no institutional thinking in future policies for the coming decades. For most politicians and academics, the design of development plans for the next century would be an absurdity. Our policies and myths on development do not think like Araucaria or Alerce trees. From the time perspective of those trees, our presence just happened like a flash. However, we can finish them all in a couple of days; our capacity for environmental destruction is almost instantaneous. Therefore, we are not only facing two almost opposite rhythms in time, but their consequences and dangers are also opposed. Economic developments do not only modify the territories, as it is quite evident, for example, with the imposition of mining concessions or the commercial distribution of watersheds. Conventional developments also alter and bend our understandings about time. Nowadays, temporal cadence is expected to be fast; when it slows down, it is politically and socially challenged. For example, in Latin-American countries there are constant claims from private capital and the State regarding the achievements of the highest rates in mineral, forestry and fisheries extraction, in the minimum time possible. Analysts and the press offer monthly, weekly, daily and even hourly reports on economic performance, investment and expenditures. The institutional and conceptual bases of our current economic development are organised so that it becomes difficult to address the problems that it entails, such as its environmental and social impacts. Our societies exploit natural resources at an increasing rate, sometimes even without admitting it. Warnings about the imminent exhaustion of non-renewable resources or the collapse of animal or plant populations due to our overconsumption are routinely ignored. Humans are not only responsible for the fast exhaustion of natural resources, but they also produce a culture of development that actively prevents them of understanding they are in a reckless drive. Varieties of capitalism – from the conventional set-ups in Western Europe to the one handled by the Communist Party of China, and from Wall Street blueprints to the Latin American progressivism based on oil, mining and soybean – all of them shrink the concepts of time and restrict the future to particular growth and consumption expectations. Stock exchange transactions are made in seconds, international prices change from hour to hour, and consumers expect immediate gratification, whereas, at the same time, humans are unable to weigh the implications of their behaviour on their grandchildren or great-grandchildren’s life choices. It is clear that the current environmental conservation strategies are not designed for the needs of Araucarias and Alerces, but are bounded to the rapid pace of contemporary developments. This explains why environmental policies in Argentina, Chile and the rest of Latin America, remain palliative, implying that the gap between conservation efforts and biodiversity loss is always expanding. To fulfil effective conservation we need to think (and feel) like Araucarias and Alerces, and to place the objectives in a more distant future. It is for these reasons that we need a conservation policy deployed until the 3015. Justifications for these long-term objectives came from two different fields. The first one is based on current knowledge of ecology and conservation biology, and the second on the acknowledgment of the need of a new sensibility and ethics to save both the planet and ourselves. In the first case, the scientific basis of environmental science shows that the fragmentation of natural environments is an increasingly serious problem. Populations of plants and animals in small patches of forests are in higher risk of extinction (as it is now the case in southern Argentina and Chile). Some studies predict a serious chain of extinctions in the near future due to forest fragmentation and reduction of its total area. Effective conservation policies should ensure the survival of species and their ecosystems in the long run; the best scale would be to locate that goal in a millennium. This is not a matter of misplaced romanticism, but the most recent and rigorous conservation science. Secondly, we need to reconsider our ideas about development. Humans need to understand our role in the predation of nature, the capitalist shrinkage of some temporal scales, and, also, our certain amount of cruelty. The cruelty of tolerating the death of living beings who have been in our territories for a -humanly-perceived- eternity. These trees, as other living beings, have rights to pursue their life projects, and this recognition requires an ethical shift. Current developments impede both long run conservation and this ethical turn, so we must seek alternatives to it. Alternative developments are not enough, and present discussion in South America is looking for alternative to the idea of development in itself, moving beyond the main ideas shared by all of them. We must recover our capacity for indignation before any further environmental destruction. We also need to allow ourselves to regain control over our sense of time. We need to slow down, for the sake of a better quality of life and for preventing an ecological collapse. We must strip away the myths and prejudices of development, and instead think and feel a little bit more like Araucarias and Alerces. * Eduardo Gudynas is a researcher at the Latin American Centre for Social Ecology (CLAES) in Montevideo. Twitter: @EGudynas and blog at: www.accionyreaccion.com.